The pipe cleaning unit (abbreviated in Dutch to LRU) from ECS is a compact brushing / blowing system for cleaning pipe systems. 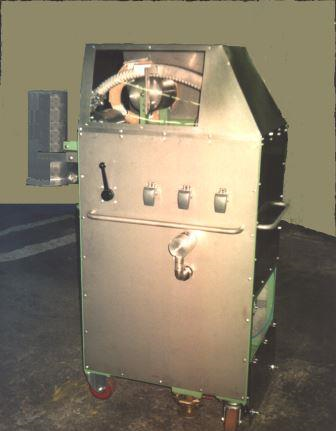 This safe and solid tool was designed for dry cleaning the inside of a pipe system, using an air motor-driven brush. • The frame is mounted on two support wheels and two swivel wheels, making it easy to relocate. During operation, the brakes guarantee that the device is stable. • The brush has a standard diameter of  220 mm, with stainless steel wires; various diameters and wire types can of course be supplied on request. • The air motor is mounted on a spring-strengthened hose, dimensioned to withstand the torque which occurs during brushing. • The infeed trolley for the brush and hose can be adjusted via a system of guides. • A pneumatic hose reel is responsible for the delivery and retrieval of the air motor brush in the pipe, and is fitted with an adjustable end stop.